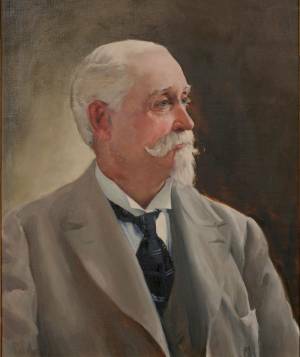 The Reverend David H. Wheeler served two terms as president of Allegheny. Although the College was wracked by faculty dis­sension and dispute between trustees and the Methodists’ Board of Control, he averted a disruption that might have brought about the College’s demise. His success was due greatly to his own popularity as a person, scholar, and teach­er. Born in Ithaca, New York, on November 18, 1829, Wheeler moved with his family to Illi­nois in 1846. He entered Rock River Seminary of Mount Morris, Illinois, two years later. From 1851 to 1853 he tutored there, then became instructor of Greek at Cornell College in Iowa. In 1855–56 he edited a paper in Illinois before returning to Cornell to teach Greek. In 1861 he won appointment as U.S. Consul General in Genoa, Italy. Five years later he was the Italy correspondent for the New York Tribune and Chicago Tribune. Offered the chair of English liter­a­ture at Northwestern University, he returned to the United States in 1867. Northwestern awarded him a Doctor of Laws degree in 1881; Cornell College conferred on him a Doctor of Divinity degree. In 1875 Wheeler became editor of The Methodist, a journal that soon merged with the Christian Advocate. In June 1883 he was inaugurated seventh president of Allegheny College. Wheeler coalesced the several schools of instruction into three departments. His reorganization of the program and effort to improve faculty harmony led to a decision in the summer of 1886 that all fac­ul­ty members re­sign. All but four were offered new contracts. A postgraduate program lead­ing to a doctor of philosophy degree was inaugurated, and affil­iations established with the Meadville Conservatory of Music and the Mead­ville Business College. Wheeler advocated in­creased emphasis on civil engi­neering and the move of preparatory students to a separate building and faculty. Though he could preach eloquently on Christian stewardship, the president found solicitation of funds personally distasteful. The stress of instituting many changes plus a touchy student disci­plinary case resulted in Wheeler’s “nervous prostra­tion” and his unexpected resignation in June 1888, but he remained on the faculty. When his successor suddenly resigned in June 1889, Wheel­er became acting president and officially became presi­dent again in January 1890. Twice a compromise choice for president, too much the gentleman to press his own views ardently, and galled by criticism for his one bold step in 1886, Wheeler naturally took a cautious approach. Wilcox Hall of Science would be begun in 1892, and Wheeler took final re­tirement in June of 1893. He moved to the Chicago area where he continued to write and to lecture until his death on June 18, 1902.